Equipped with dual agile RF transceivers, each based on AD9364, the VPX571 is the latest board from VadaTech. 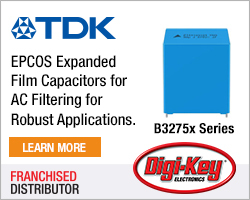 One channel includes a programmable filter on transmit, adds VadaTech. 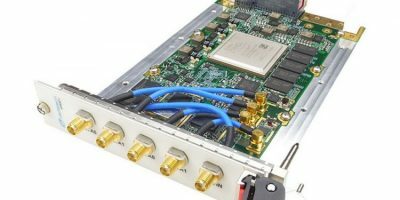 The combination of dual AD9364 with UltraScale+ MPSoC provides a complete transceiver solution for software defined radio and signal integrity applications, supporting both time division duplex (TDD) and frequency division duplex (FDD) operation. The module is available with RF routed to front panel or to the rear via a VITA 67.2 connector. The AD9364 operates in the 70MHz to 6.0GHz range, covering most licensed and unlicensed bands. Channel bandwidths from less than 200kHz to 56MHz are supported. 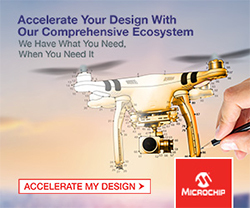 The module is compatible with Analog Devices’ RadioVerse design tools to simplify radio development across a range of applications. The module has eight TX/RX SerDes, dual GbE, eight LVDS (which could be configured as singled ended), CPU RS-232 and management RS-232 to the P1 connector. The FPGA interfaces to a single DDR4 memory channel (64-bit wide), allowing large data sets to be stored during processing as well as for queuing data to a host. 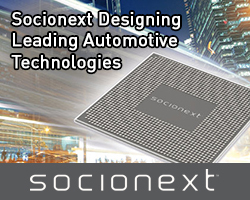 VPX571 is based on Xilinx UltraScale+ XCZU15EG MPSoC FPGA, which has 3528 DSP slices and 746k logic cells. The XCZU15EG includes a quad-core ARM application processor, dual-core ARM real-time processor and Mali graphics processing unit, as well as over 26Mbit of block RAM and 31Mbit of UltraRAM. The module also has on-board 64Gbyte of flash, 128Mbyte of boot flash and an SD card as an option. VadaTech provides embedded computing from board-level products, chassis-level platforms, to configurable application-ready systems. The company has a focus on AdvancedTCA, MicroTCA, VPX and PCIe and combines electrical, mechanical, software, and system-level expertise to provide customised commercial or rugged computing to meet the most complex customer requirements. VadaTech also offers specialised products for VME, CompactPCI, and other architectures. The company is a member of PICMG and VITA. VadaTech has headquarters, design and manufacturing facilities in Henderson, NV with design, support and sales offices in Europe and Asia Pacific.